The equine industry generates $613 million annually for Sonoma County businesses, supports over 7,700 jobs, and provides almost $12 million in annual local tax revenues for Sonoma County governments from direct spending on equine ownership totaling $464 million. There are ripple effects on Sonoma County that add to the equine industry’s local economic footprint. 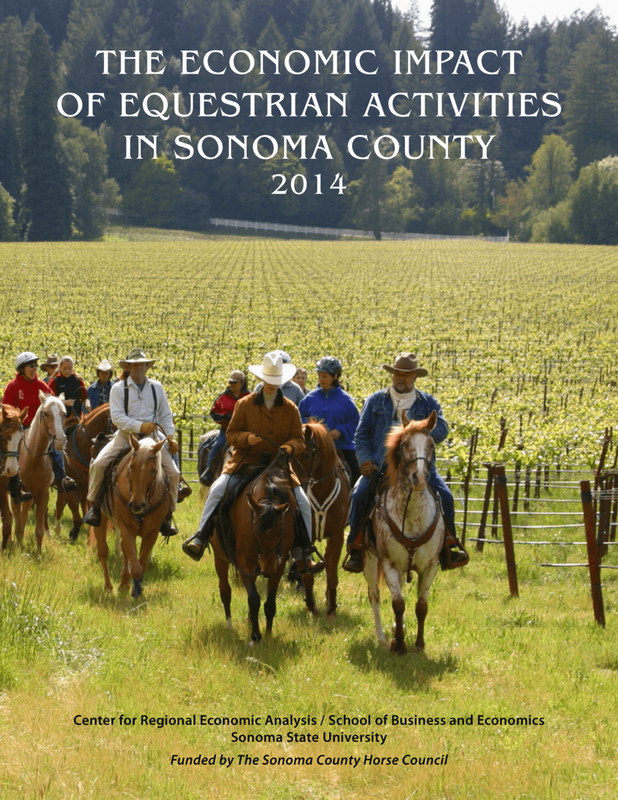 This report summarizes information from a recent study of the economic impact of the equine industry on Sonoma County’s economy. Based on data from Sonoma County equine veterinarians, approximately 26,217 horses lived in Sonoma County in 2013. A survey conducted between November 2013 and March 2014 provided primary data on equine businesses and ownership. Additional information on spending by horse owners was also gathered from local businesses and equestrian operations. The resulting conglomerate data demonstrated that for every horse in Sonoma County, businesses earn $23,386 annually and for every 34 horses, 10 jobs are annually supported. Supporting a job means that the spending done by horse owners and allied businesses creates income for other businesses that allows them to retain their workers. Visit the University of California Cooperative Extension website for a large number of fact sheets, useful information, and access to educational resources. The EPA has published a brochure entitled "Source Water Protection Practices Bulletin: Managing Livestock, Poultry and Horse Waste to Prevent Contamination of Drinking Water" in PDF available for download below.